Don’t be fooled by the name of this product. 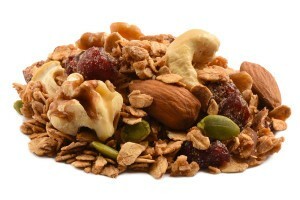 Yes, chocolate banana granola does feature a highly popular flavor combination, but it also has lots more to offer. Cherries, coconut, almonds and a hint of aromatic vanilla flavoring are mixed in to elevate the deliciousness of this snack to a level you might not have anticipated. Oats, Dark Brown Sugar, Sliced Almonds, Coconut, Dried Cherries (Dried Cherries, Sugar, Sunflower Oil), Vanilla Flavor (Propylene Glycol, Water, N&A Flavor, Caramel Color, Glycerine), Cinnamon, Salt. Dark Chocolate (Sugar, Chocolate Liquor, Cocoa Butter, Anhydrous Milk Fat, Soy Lecithin (An Emulsifier), Vanilla, Gum Arabic, Corn Syrup, Sugar, Certified Confectioners Glaze. Banana Chips (Banana, Sugar, Coconut Oil). Big chunks of chocolate! Huge dried slices of bananas! This is a healthy snack but it causes too much temptation not to mix it with ice cream. Can’t go wrong with these. Everything a snack should have and healthy on top of it! Earn up to 61 points.